All parents struggle with keeping their kids playrooms and toys organized. 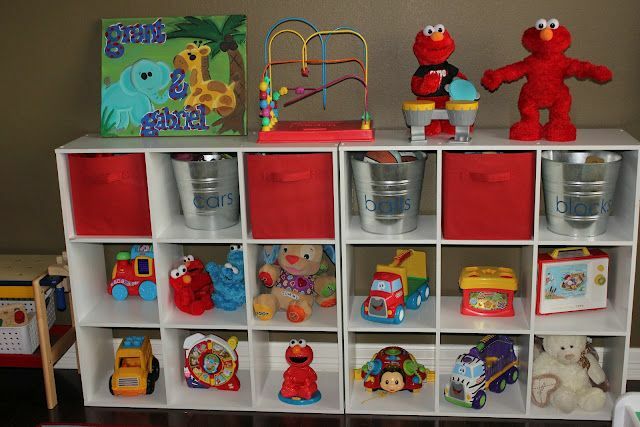 You need to find appealing storage and design and have all of the toys accessible for your little ones. Today’s guest blogger is sharing her playroom and it is just a dream, I hope you take inspiration from it to use at your own home. Hi, I’m Krista, from the blog Life With Both Hands Full. On my blog I share how I keep my life organized despite the chaos that having twin boys brings. Today I am going to share with you our playroom. We have a little Reading Nook made up of rain gutter bookshelves. Having the books where they can see the covers make it easier for them to find what they want and makes it easier for them to put them back neatly. Instead of buying art for their playroom, we made our own. I framed some pictures of my boys, their first finger paintings, and the rest I made with patterned paper and vinyl. To organize their toys, I used the Closetmaid cubeicals and bins. I use the bins to contain the smaller items like balls, cars, and blocks. Now I feel I should let you know that our playroom does not always look that neat but I do have some tips on how to Keep it Clean. My biggest secret is this shopping cart and wagon. We use them to “go shopping” for our toys and then put them all away. It makes a huge difference in a child’s attitude about cleaning up if you make it seem like a game instead of a chore. Since I contacted Amanda about guest posting, we have moved our playroom upstairs into our “bonus room” which is bigger, which means a whole new room with more space to organize and decorate. So follow along with us at Life With Both Hands Full to see the progress. Great ideas! Love the cute artwork and I love how you have your kiddos go “shopping” to help clean up. Great tips!